Hmmm, I might try this on my next kit. I oil washed my Yamato VF-1S which was airbrushed with Future. It might be my oil paint or the ratio but the panel lines wre not consistent. Gaps showed on the panel lines. It's like somebody was sending Morse code. LOL. How long after did you remove it? I usually wait 6+ hours, and then am really gentle on how I remove it. I often use the removal technique to introduce stains and other lines, like from oil leaks or fuel spills. I left it on overnight. 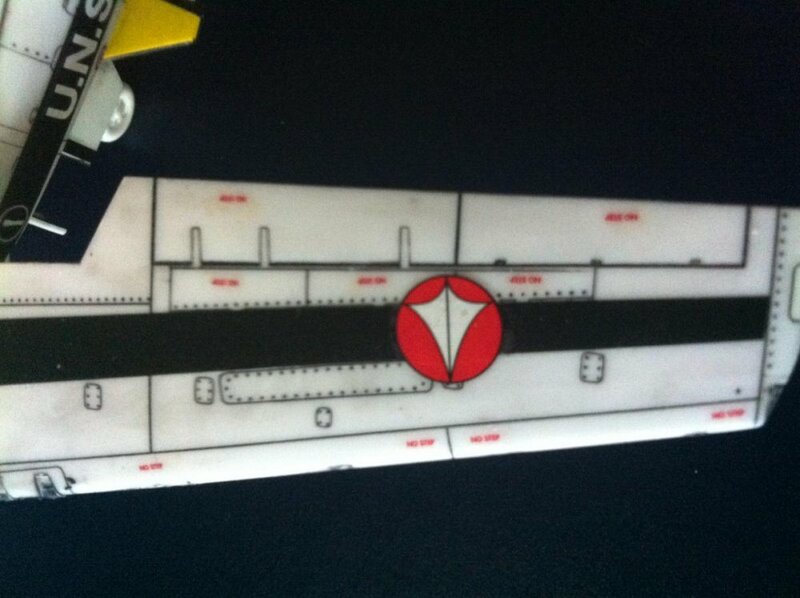 Maybe the Yamato panel lines grooves are too shallow? I'll do that. Thanks, Noy! Here is the end result, some part looks smudgey and I think the wing is best done. Some body lining are a bit faded but over all I'm okay with the result as a first run with enamel + thinner. Found it easy to just brush everything with the enamel, bit of thinner to wash over initially (since you can't clean it all at once with the one tissue) then clean again. Hope that makes sense. Just added two pic to show the details of my work, the body isn't as well done as the wings. OK, I think you've got the panel line washing down pretty well for a beginning effort. Now, let's talk about puttying, and seam-line filling. Yes, that's where you remove the gap/unevenness between where 2 parts fit together. It's a very good skill to learn and use. Basically, what you need is some modeling putty (I recommend Tamiya Basic Grey), some type of putty knife (I use something like #15131), and some 300 grit sandpaper. Run a line of putty down the seam, smooth and shape it (and remove excess) with the putty knife, sand it smooth once it's dried, usually 24 hours. You should see a big improvement in your builds once you get the technique down. The way I do it is this; I get two grits of sandpaper, 600 and maybe something above 1200. I sand it down so its flat with the 600 and then sand it really fine down to nothing with the 1200. Now I get some polishing agent.... tamiya makes one but you can use any one... I've seen people use toothpaste before. and really really get it smooth. 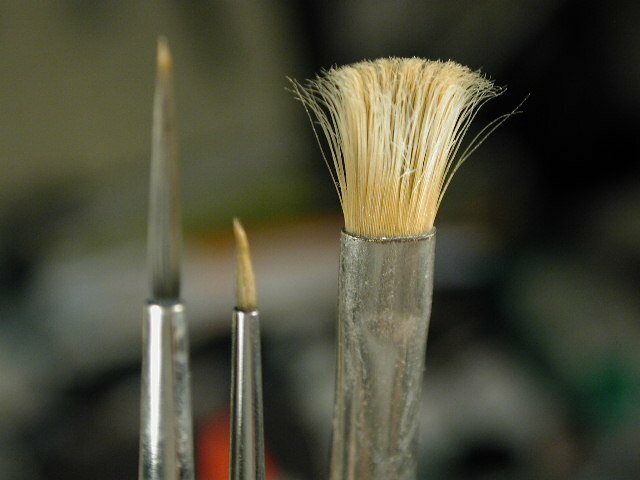 It should have a milky or distorted texture once you're done and washed the part thoroughly (this is important). Next, get future and dip the canopy (or just pour it over like I do and let it set. You should have a clear canopy as a result. In general you should always dip canopies in future: it protects the plastic and gives off a really nice sheen that makes the canopy look realistic. Yes, clear parts are a whole different animal. Don't use putty on them! AH thanks for the tips, maybe for the new model coming this month I'll try making it even better. about ten years ago I bought a Hasegawa Colored Clear VF-1J kit (this thing: http://www.hlj.com/product/hsg65752/Sci ) I never got around to doing anything with it and it's been sitting in my closet ever since. I dug it out recently and was thinking about maybe putting it together but I'm not really sure how to go about it. I wanted to keep the clear look with just a few parts painted and all of the decals applied, but I'm not sure how to go about painting and assembling that much clear plastic. Will Tamiya extra thin work for the glue or do I need to use something else? The glues will work on it... question is how will it react. I don't have an answer for that TBH. White glue might be the only safe option, though I've never made a model out of it. 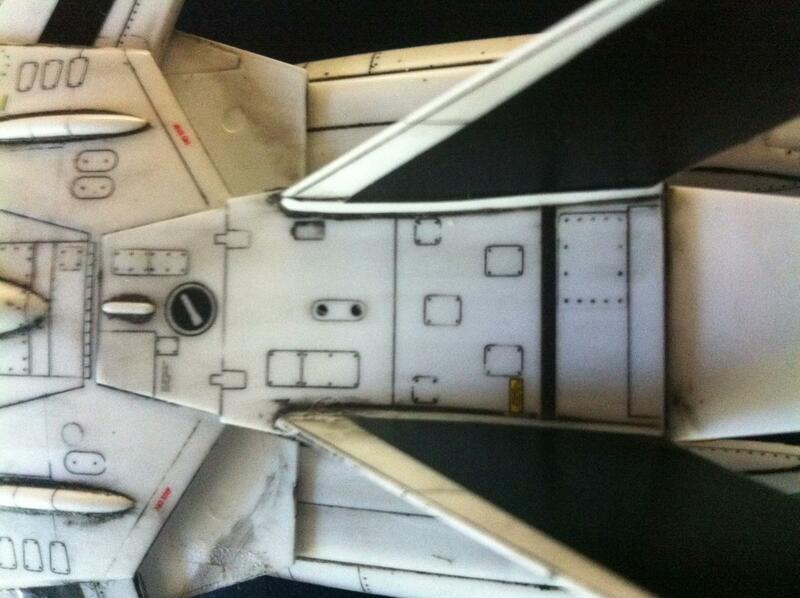 Revell of Germany makes a canopy glue... never tried it but its supposed to prevent it from going white. Maybe only paint parts of it and scratchbuild the interior? What clear colour is it? Is it the neon ones or pure clear? Neon I can see making it look as if its in Fold space... clear would be cool as a cutaway, as they do now with some aircraft carrier kits. BTW those decals are somewhat valuable. Firstly, WOW. I wish I had that kit. A lot. 1. Coat the entire model in future floor polish of derivative (dependent on region). You may have to set up a 'bath' with a drying rack area for your parts and purchase more than one bottle of the acrylic floor polish. I soak all my clear pieces in future for a day and let them dry in a close compartment on either a non-reactive rack or wax paper. The benefit of doing this, is that you can re-soak your model to remove the future floor polish barrier if something goes wrong. I've done this with botched canopies and it is a stress saver. 2. 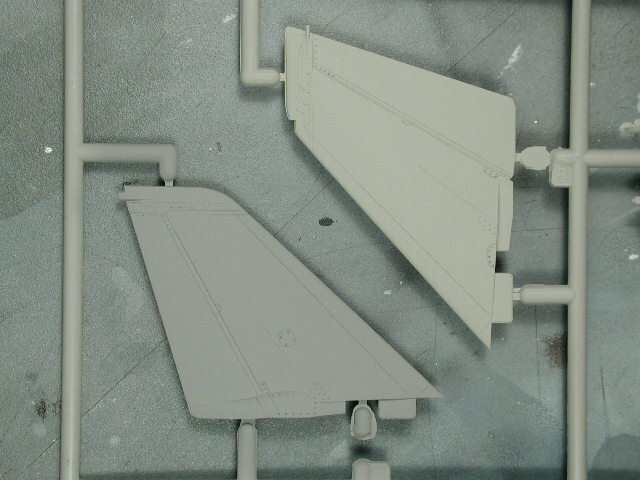 I would use extra thin types of cement sparingly, and i would recommend using the Revell canopy glue that Noyhauser suggested. I do not have any practical experience with it, but it does seem to be well regarded in other modelling communities. 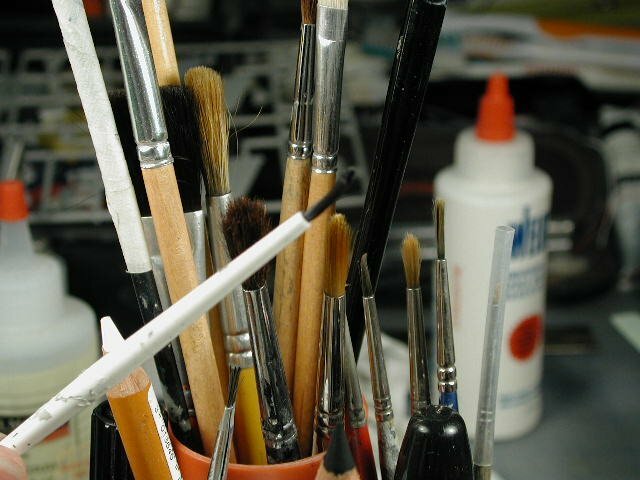 You may want to test it out on regular styrene scraps or even parts of the clear sprue to see how durable it is under duress and handling. I haven't built my Hase' VF-1 yet so I don't know it there will be a lot of frustration in your process but considering the brand you shouldn't really have any major issues. Forgive me if you already have a few models under your belt and don't need this guidance, I figure it is worth posting however for posterity and other viewers as well. 3. I would coat your model again in major sub-assemblies with the floor polish, and have a compartment where you can keep dust etc away from it while it dries. Wear gloves when you handle it, as I have found that the heat from my fingers can leave finger print smudges in nearly cured floor polish. 4. 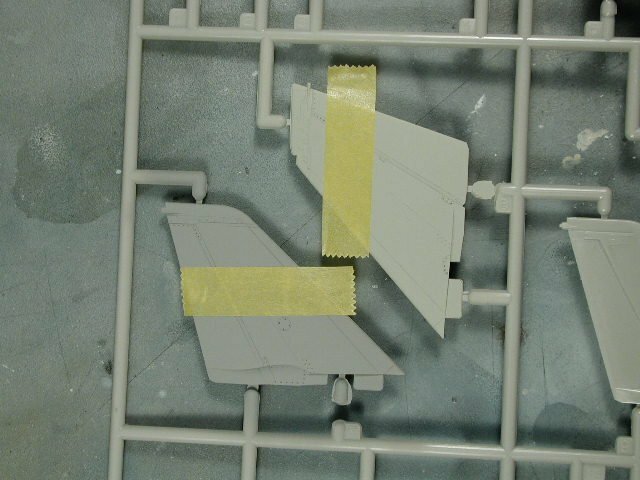 You may be able to use a plastic polish to re-shine your model after final assembly in key areas like the canopy and wings etc. Test on scrap sprue beforehand to make sure that it isn't too hot. Thanks for the replies. To clarify a few things; the kit is molded in the same bright aqua blue as the picture on HLJ. 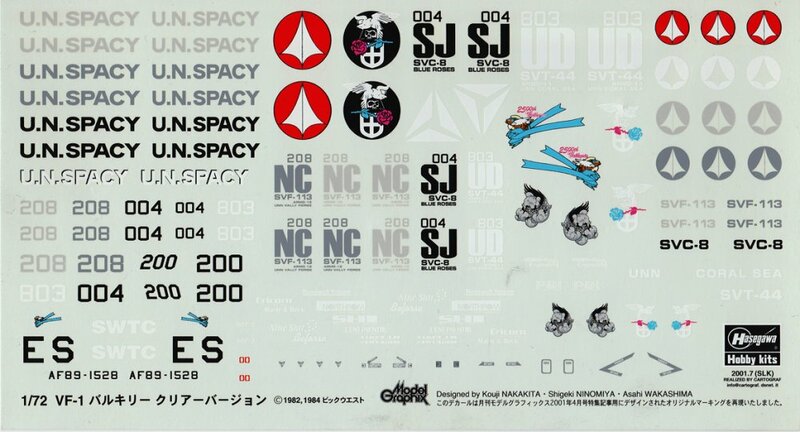 Since it's a VF-1J, molded in clear blue and has the same decals as the standard releases of the 1J by hase, I was hoping to do a Max 1J scheme where all the blue is left showing the bare clear plastic. I've built a few aircraft models before and a decent number of kits from other genres, but this is my first time having a kit that's entirely clear plastic. Also, I'm well aware that the second set of Model Graphix decals that it came with are pretty rare. That's a whole other can of "what should I do with this" worms, seeing as how I wasn't planing on using any of those schemes on this particular kit. What do they look like? 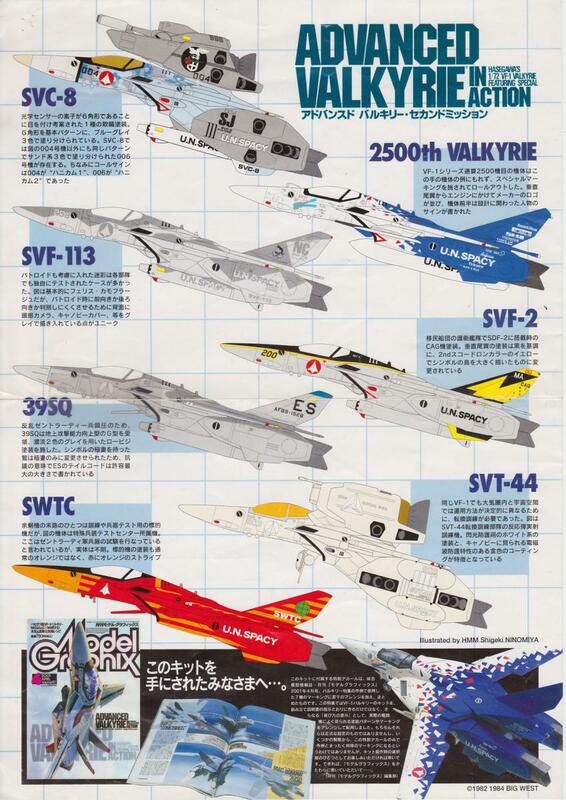 (I'm not asking for a high-res scan for download). I saw 2 of these kits at a hobby shop yesterday, and if they're nice I may pick them up. I probably won't build it clear, though, if I do buy. I have a quick question that can probably be easily answered by one of the many modelers around here. I've been using future floor polish (Pledge Futureshine) and the finish is fairly glossy. I was wondering what's the best way to dull the finish of future, down to flat or semi-gloss? I have some testors acrylic clearcoats, does future react ok by mixing the two? Never tried that personally, but I've read about other people who mix future and model master (basically the same as Testors) and made it work. Tamiya Makes a product called X-21 Flat Base, I've used it before and had ok results with it. I use several different products, but probably the best I've found is Alclad Flat... it gives a dead flat appearance that I really like. Flat base is nice (and its more durable) but hitting that ratio can be hit and miss and become a real pain. Is there any way to tighten the ball joints? Some part on my messiah is very loose so the hand is kind of flappy. Try a layer of clear nail polish on the ball portion of the joint. Let it dry before you fit it together, though! clear nail polish, Future and super glue all work, and it's basically the same process for each, coat the ball and/or the cup portion of the joint, let it dry, then reassemble. Sticking a patch of electrical tape to the inside of the cup portion of the joint also works. One thing I've been trying recently is using this stuff called silicone sealing tape. (it's sold under all kinds of names: rescue tape, self-sealing tape, stretch and seal tape, atomic tape, etc). it looks like electrical tape but it's a strip of silicone rubber that's very stretchy and sticks to itself. the more you stretch it and put it under pressure the more it sticks. I've had luck with both cutting it into a thin strip and wrapping the ball portion of the joint with it, and also with lining the inside of the joint with a square of the stuff. Thanks for the replies, will cement work? 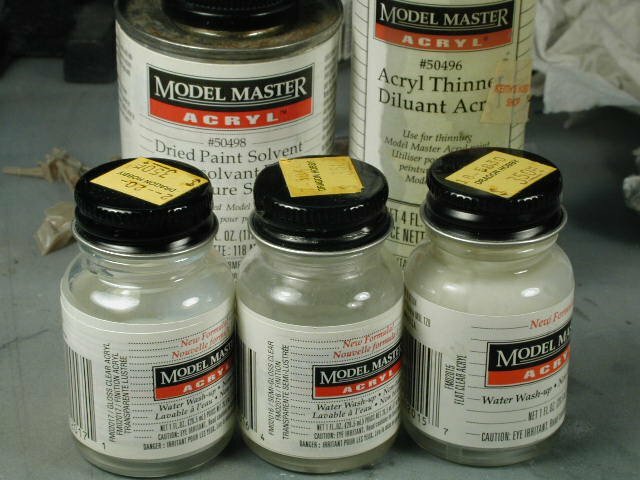 The stuff used to glue some model pieces together. Hey I just wanted to thank you guys again for suggesting the Tamiya X-21. I picked some up today and mixed some satin finish using the ratio's on the web page linked above. Worked perfectly and the future self-smoothing properties gave everything a pretty awesome finish...so thanks!!! Hey, I have another question. 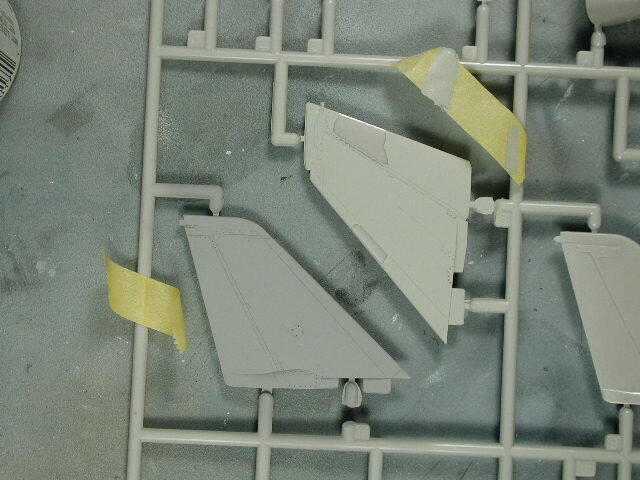 Has anyone ever tried using RIT dye to color the white plastic of the Yamato VF-1 build kit more of a low vis grey? Would it work on that type of plastic? I could paint the whole thing, but an acrylic paintjob would probably last all of one transformation before flaking off. You know, we used to dye virgin nylon parts for R/C cars. I've stained some styrene wiping permanent ink off with isopropyl. It just might work. The only hang-up is that heat is used to make the dye set in. If you tried it, you would have to CAREFULLY watch the water temperature to ensure the styrene does not warp. I'd try it on the sprue from the same kit and test it out to ensure it will work (batches of styrene can vary). I tried it. For some reason it didn't take as well as I hoped. Dying that ABS black turned it into CF Brown... at least I know how to make more CFs. lol. 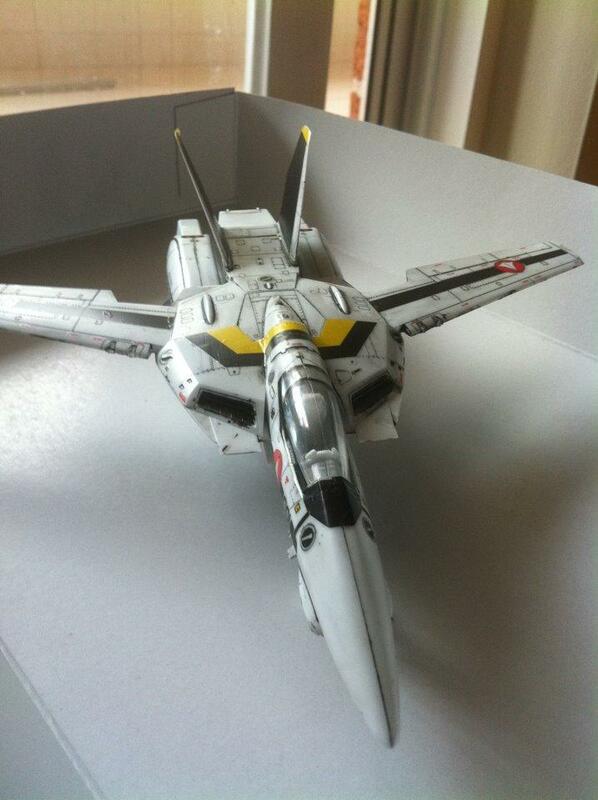 I´ve found one old backup with some photos that may belong to master wm cheng (the backup contains images of some of his macross models posted in the forum) I think that the reason of the photos is some sort of tips for modellers. Would be nice to add the missing text to them. I believe the first pic is his fave clear-coats. Testors Model Master acrylic gloss, semi-gloss, and flat. That's what I've started using. Airbrushing those is super easy and gives me good results. Have you tried the new alclad range Derex? I moved over to them about a year ago after basically going through about 7 different brands, and found they were the best.